At last weeks Wireless Life Science Alliance Conference held on the beautiful waterfront in San Diego, Nokia CTO Henry Tirri announced that the brand that defined the last decade would be supporting Qualcomm’s search for the Tricorder (a term that’s used under license from CBS Studios) by launching their own “Nokia Sensing X Challenge” with annual contests running for the next 3 years that will be awarding $750,000 prizes to winning teams. In addition to the website there’s an interesting video from the event, the usual press releases (Nokia, Nokia Conversations) and already some positive news coverage (The Verge, XConomy, MD+DI) that’s probably worth the $750k/annum spend to Nokia already (they did after all spend $25m to make the new Lumia 900 the exclusive free phone for AT&T employees). Wider reporting of mHealth developments from the event can be found at MobiHealthNews. With it’s shift to a Microsoft Smartphone strategy it’s now obviously having to listen to the desires of the US mobile industry and this is a very positive thing for mHealth as the Deloitte survey has found that amongst execs in this industry mHealth is currently considered to be the most promising growth opportunity. One big positive of all this change is that it’s now accepted that there is a need for great leadership to correct the downward trend and with that will no doubt come the more decisive attitude of an underdog: brave and not consumed by a fear of potentially getting it wrong. Obviously in the past there have been some protracted legal battles between Nokia and Qualcomm over the use of Qualcomm’s IP but with the shift to Qualcomm’s mobile processors a key part of Nokia’s Windows Phone 7 strategy there’s obviously been some very close working between Nokia, Qualcomm and Microsoft as they’ve put new smartphones to market in an unprecedented time frame. A positive upside to this is that Nokia has now become infected by Qualcomm’s long standing enthusiasm for mHealth (Paul Jacobs actually refers to Qualcomm as a “medical device company”) and while it may be Nokia’s first time attending the WLSA event (which is in it’s 7th year) it’s definitely joined the party with a big bang. It was fascinating to learn from the video that it only took Dr Peter Diamondis, Chairman and CEO of X Prize, to make a single call to the mobile phone of Nokia’s interim CTO (who was only meant to be picking up a coffee at the Starbucks in Palo Alto!) to get the worlds biggest mobile brand on board. There is no doubt about it Peter Diamondis has got to be the MOST influential man in mHealth. 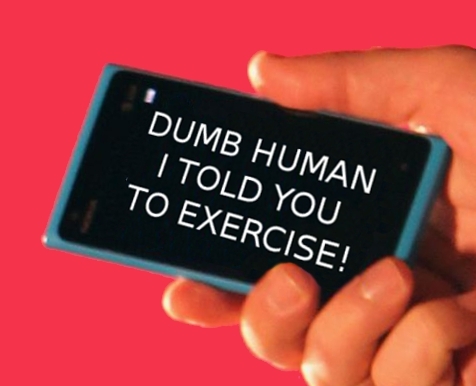 The mobile as a sensor, aren’t we past that stage? I found it funny to hear Henry asking Paul Jacobs if he would agree that the camera was a sensor. I might have told how I considered the mobile to be just a sensor that we carried with us all the time to a Mobile Monday audience back in Jan 2010 but this was actually something I picked up from Paul Jacob’s father in a talk he gave in London about the convergence of consumer electronics to mobile, a decade ago! I wonder if Nokia sees this as the future of R&D? 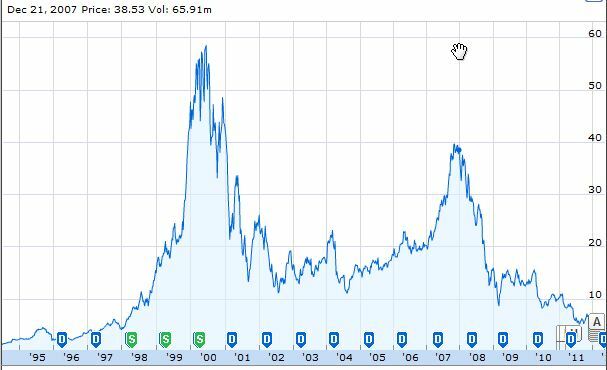 Nokia used to be the biggest European investor in R&D and it paid off through the creation of a war chest of patents that in one of those oddities of stock valuations are now valued at more than the company. Previous efforts to work externally with the mHealth developer community through an “Open Innovation” program (now closed) were a little disappointing (I found it to be too focused on the inward transfer of innovations whilst giving little/no credit to the originators of ideas) but I’m once again surprised that the Nokia Sensor X Prize website doesn’t expressly mention how intellectual rights are apportioned for those innovators who would like to try and win the award. The X Prize organisers have got in touch to explain that there’s been a misunderstanding here by me and the competing teams do indeed retain all Intellectual Property Rights associated with the design, manufacture, and operation of their Entry. My feeble excuse (if you’ll grant me one) is that this information is provided to teams as part of a “master team agreement” that they are sent when they register for the competition. It’s interesting to consider the value Nokia could gather from the submissions it will get from competing teams as I’d expect a lot of people to share good ideas and concepts freely. How good and how many is anyones guess but Peter Diamandis is expecting “hundreds or thousands of entrepreneurs and teams” and when you consider the enthusiasm that already exists around X Challenges and Tricorders (eg. see Peter Jensen’s Open Source TricorderProject), and then compare this competition to the run away success of other mHealth competitions (eg. this years 2012 WLSA iAwards was entered into by 160 companies at a cost per entrant of $250 and the only prize was industry recognition and a small trophy) it’s very likely to be very popular. I also think it’s going to get very interesting as competing teams submit plans to leverage innovations and intellectual property of other companies to make their “new generation of healthcare biometric sensors”. I wonder how many teams simply bring together the innovations of existing mHealth entrepreneurs? I wonder if we’ll have any big pharma or medical device makers serving patent infringement claims on winning X Prize teams? It’s also interesting to consider how big medical device companies are going to react to the news that Qualcomm’s CEO now considers the company to be a medical device company and the news that it’s now being joined by Nokia with efforts to made disruptive changes in their markets. Obviously I’ve been saying for a while how this is going to end up – as the big legacy medtech and pharma brands who don’t yet see the opportunity in the newest mass media face the prospects of becoming obsolete and disappearing – just as we’ve seen occur with countless Camera, Music and Computer brands over the last decade. Isn’t our problem “making sense” rather than “more sensing”? Close to 1.3 Billion people smoke. Many chose to IGNORE the knowledge they have of the harmful effects of smoking. 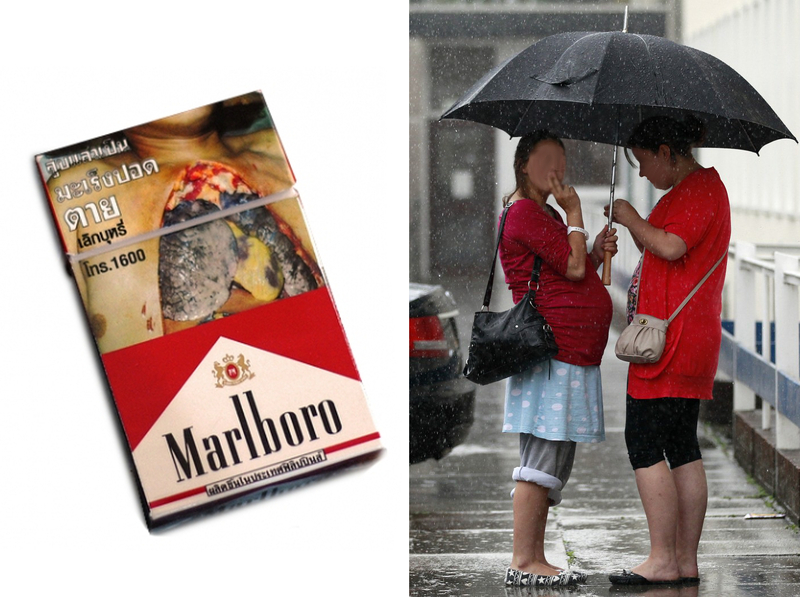 Some of them even take the cigarettes they smoke out of packaging that is printed with images of diseased organs. Some of these are Doctors and Clinicians who could tell you all day about why is harmful yet they continue to behave in a way that has their employers feeling the need to enforce premise wide bans to stop the activity happening right outside their entrance doors. So let’s jump right into 2020 and here’s your tricoder. Zap. Okay you have these problems, do this, do that, everything will be better. Except people won’t have changed, the problems won’t have changed. Inidividuals will still chose to behave as they want. Obviously Paul Jacobs likes the idea of using this tech for acute emergency care in emerging markets but that’s still following the fix -what’s-broken reactionary approach to medicine that we have in the West and it’s probably not going to have the impact there that you’d get from just mandating vehicle road worthiness tests or the wearing of crash helmets & seat belts. You’ll still need ambulances and Doctors if you want a chance of surviving so you might also want to be careful you don’t completely undermine the basic work they get to exist by on. 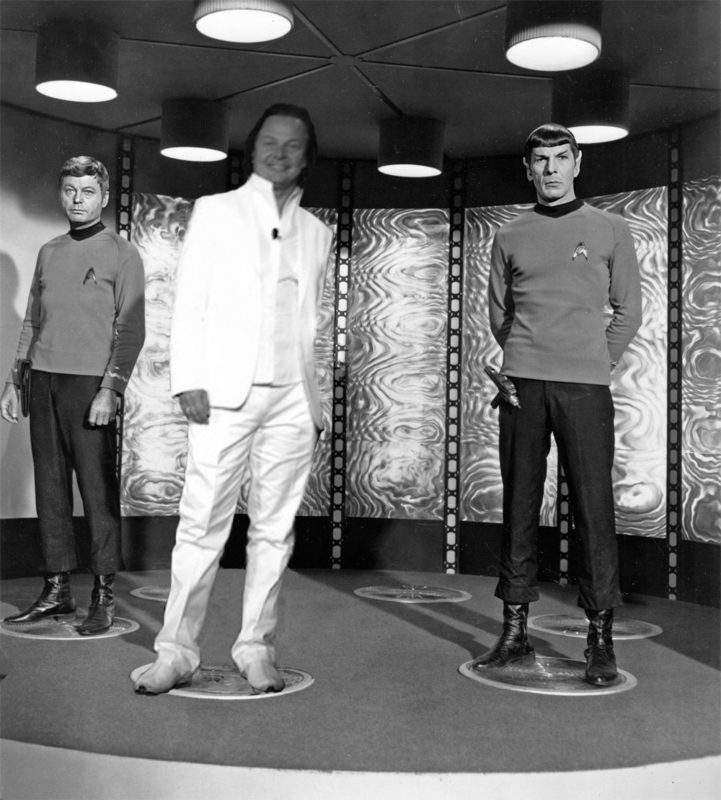 If you have a bleeding aneurysm no tricorder will be enough – you need a surgeon quick. In emerging markets it’s also going to have to face the enormous challenges of trust (is that a fake tricorder you’ve got there? when was your tricorder last serviced/updated?) and the inevitable misuse/abuse of the tech (eg. an employer who decides to screen his workers, a husband who decides to divorce his wife because the Tricorder revealed something, a police officer who frames you because there’s something in your blood stream, etc, etc). Privacy was touched on in the livestream video and it was fascinating to hear the opinions of the group on the privacy implications eg. a Nokia CTO stating there are no privacy implications with location. My feelings are very different and this perhaps originates from my first hand experience of trialling, using and providing mHealth tech eg. the months of repercussions for a patient that emanate from a reading from a single lead ECG embedded in a smartphone. But the increasing we have to diagnose/read other people (perhaps even without their consent) is going to bring up huge new ethical debates eg. “I’ll send this child to school and keep her on the farm because the tricorder says she has XYZ”. In my opinion advances in health aren’t going to originate from gigabytes of digital data being collected from our bodies every second because we’re creatures of habit and we already know enough about what to do and what not to do. Health deterioration isn’t happening in time frames measured in seconds but is related to persistent life style choices. Advances will happen from learning how to engage patients and filter communications so that we can improve everyday decision making but the data we need isn’t elusive e.g. I can approximately calculate how much exercise you get by just looking at your Facebook account. 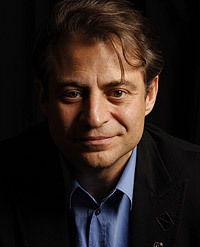 Dr Peter Diamandis Interview: End of the Doctor? I think this is a very common misunderstanding. We do actually know more about our health status that these machines know about themselves. What’s more I can learn. If I don’t know where I was made I can find out. I can learn why things aren’t good for me and why other things are. I can eat different fuels (don’t try that one in your airplane!) and I know where I can get it. I can learn how to get new types of fuel and when I’m not feeling 100% you can bet I know about it and this isn’t a new phenomenum (we describe these feelings as “Symptoms”, another word we use everyday in medicine that’s adopted from the ancient Greek language). The idea that healthcare is some once a year event that involves the exchange of a few bytes of info suggests Peter is not appreciating that even when the medically untrained look at their partner or parent they’re actually processing gigabytes of data per second. In reality when your Doctor sees you walk in the door their retinas are connected at about 10 million bits per second to their brains (a structure that has been built for pattern recognition). Obviously if you’re going to be getting close to this you’re going to be replicating the processing powers of the brain but of course at that stage the idea of a Tricorder will be redundant. What I do with this knowledge is where we fail. How we filter it into actionable data and use it to motivate myself to act based on information should be the goal. A computer/plane/car that simply says “hey I need you to top this oil” is in many ways more analogous to small animal Veterinary Medicine. By and large Veterinarians don’t have the challenge of managing patients who willfully stop taking their meds (owners mix it into their food), similarly they don’t have patients who hop out of their kennels and go down the pub or order in some fast food and gorge themselves on chocolate deserts. PS I’m involved in several veterinary medicine applications of mHealth and it’s incredible the insights there are to be had from this market particularly if you’re interested in attaining peak performance in areas like livestock breeding or competitive racing. In my experience the car that is even starting to have somewhere near as much data as a human already has will be a car that can motivate itself to coordinate its own diary, change it’s own tyres, leave in the morning to earn itself a living and come back washed and filled with fuel. Until then it’s not really comparable from a data analysis perspective. Okay so let’s say that future happens when you’re lying in bed on a Sunday morning dreaming of the bacon and eggs you’re going to be putting in your frying pan. No need for the monitoring, you know you should have got up hours ago. No need for monitoring, you know the muesli would be better for you. Unless of course the sensors have also got the capacity to supply willpower. In my opinion this is just a failure to support primary healthcare. mHealth sensors will no doubt continue to transform healthcare but it won’t amount to much without a functioning primary care support system. As Peter points out not only are there massive failings in primary care but most of it isn’t even properly online yet. Fortunately there are more advanced markets where primary care has been prioritised and patients have access to informed Doctors out of hours and high quality private sector services (like 3G Doctor) as an alternative to the ER. Dr John Bachman MD, Prof of Primary Care, does a great job of explaining this opportunity in this video. That’s because a lot of what they do is wasteful, ineffective and tied to out dated business models. An interactive history taking questionnaire has been proven (and published in a Mayo Clinic Proceedings paper by Prof Bachman) to eliminate the need for 80% of in office consultations yet it’s adoption languishes. Not because there aren’t enough Doctors but because those Doctors like taking histories or typing information into computers but because they work in a broken system and have enough hassles just getting paid for what they do already and fear trying to mess with that. I’m really surprised to hear a Harvard MD claiming that the solution to patients entering the healthcare system with a common cold needs to be solved by a Tricorder. Patients manage the common cold all the time and if you think we need dedicated sensors that we don’t already have for this you’re going to be adding trillions to healthcare budgets. If you’re desperate for a sensor solution an IR camera on your smartphone would probably be enough. Regarding a Doctor as just “a gateway to subspecialists or technology tests” is a symptom of the failed US healthcare system and the way big business and insurance companies have undermined the good old trusted family Doctor relationship (where the best possible care is still to be found). I think this is an interesting strategy but there’s little evidence that accurate Tricorders wouldn’t just be used by patients to actually justify having just one more doughnut/beer/cigarette. After all it’s going to presumably become easy to measure how little impact just the one more will have. Not sure about this either. I don’t know anyone who doesn’t know what the inside of a fast food restaurant or an ice cream palour looks like. Because we’d turn it off as soon as it got annoying? I’ve often been surprised by the enthusiasm there is in the mobile industry for using the developing world as a guinea pig for mHealth eg. Stanford Medical School, MIT/Harvard, etc. It’s a terrible shame that we seem to have learnt so little from the war time history of the pharma industry that we’d even consider developing mHealth by letting these innovations be trialled and developed on patients who are so poor and unrepresented. I get the impression that there’s some confusion about the relationship between a “sensor reading” and “access to healthcare”. I’m not so confident it’s as tight as is being made out eg. I can tell you you’ve got XYZ but quality treatment for it will be way out of your reach. Similarly as with most things in life it might be best not to treat it but to manage it and then we’re into something very different and probably raising patient expectations to a level that’s unfeasible. In emerging markets there will no doubt be a range of charlatans to fill this need gap so I wouldn’t be surprised if the first Tricorder sales in a market like China will be to the health quacks. Refuse to sell them and they’ll likely be making their own before the week is out. There’s a lot of enthusiasm for “continuous monitoring through sensors and sensing technologies to keep people healthier, avoiding unnecessary hospitalization and ensuring that those who need urgent care can get it sooner” but I’m not sure there’s much evidence to support this will pan out as desired. Prolong active working lifes yes. Improve quality of living, absolutely. Defer healthcare costs, most definitely. But reduce overall total healthcare costs? I can imagine the costs of the extra defensive medicine (eg. unneccessary tests and procedures) will be much more significant. It’s also worth considering a very good paper published recently in the British Medical Journal about the issues surrounding overdiagnosis and overtreatment, the threat this poses to health and the healthcare resources it’s already wasting which would be amplified by the tricorder innovation happening. It was fascinating to hear Qualcomm’s Paul Jacobs being so candid about the need for the 2net Hub and Platform being simply to satisfy the FDA. 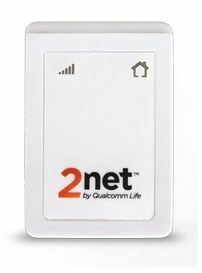 I’d recently seen Qualcomm execs trying to sell this on a booth with Orange/France Telecom at the eHealth Week exhibition in Copenhagen and it didn’t make any sense at all to me eg. why not just use a patients mobile as the hub. If you need one example of how the FDA is failing to support the development of mHealth you need look no further than 2Net, if a powerhouse like Qualcomm is having to make such pointless expensive undertakings simply to get a chance at making changes what chance have US startups got? Looking further out I could see this having several negative effects on mHealth funding and service exspansion the US. In the fast moving world of mobile where most smartphones are now shipping with tetherability it can’t be good to be building out services on any certain technology just because the FDA requires it as they could just as easily change their mind and drop this requirement at any time (leaving you with an expensive redundant installed base of connected devices, a product that’s obsolete, etc). The Nokia press release reminds us that “Every day, more than 1.3 billion people use their Nokia to capture and share experiences, access information, find their way or simply to speak to one another” so it’s disappointing to me that the focus of this first high profile public mHealth mention from Nokia focused on an uncertain future point in time. Many colleagues don’t understand why I have this posted on my wall but for me it holds within it the key to the adoption of technology. It’s obvious to me because I’m constantly bombarded with press releases from companies that consider themselves leaders in mHealth but when I meet with the execs who work there I find people who would no sooner use mHealth themselves than take a bath with an Alligator. I’m well placed to comment on this as I have met with representatives of nearly all of the big Mobile brands that have/are developing mHealth brands. Everyone of them employs thousands of staff, the vast majority of whom have the latest video mobiles. In the large part they pay their employees sick leave, they meet the costs of losses associated with sick leave. But when I meet their execs at a conference and ask to look at the cool mHealth services they get at work they tell me “oh that’s just some PR. We don’t actually use any of that yet. We just take time out to go to the Doctors like everyone else”. Then they hop up on stage and start telling the world how powerful medical sensors in their mobile phones and data carried on their networks shared publicly across social networks will create imaginary services for imaginary patients of the future and solve all the challenges in the world healthcare. 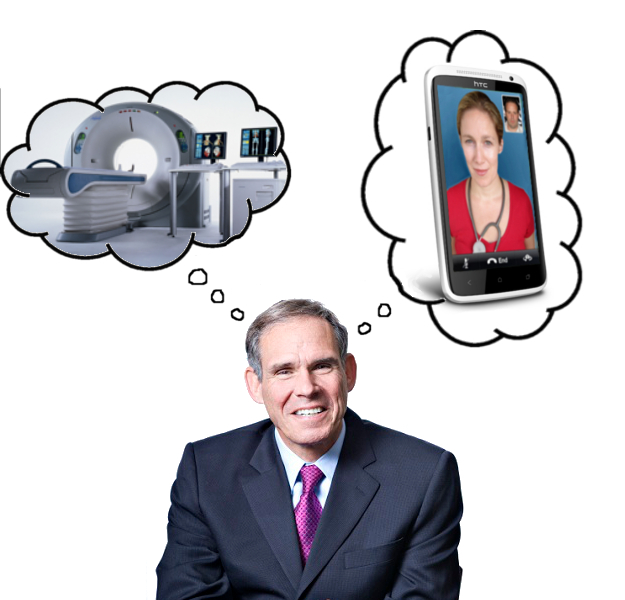 That’s right the “Most Influential Physician Executive in the USA” Eric Topol MD had no problem getting access to a CAT scanner (the cost of which is north of >$1m – especially if it’s the nice Aquilon machine at HillCrest), no problem getting a multimuillion $ fully staffed operating room, a ureteric stent, an anesthetist, etc, but what he failed to get was access to an informed Doctor when he wanted one. Instead he suffered because his daily SMS’s, calls and emails were ignored for 8640 MINUTES (if you’ve ever seen a patient suffering with severe flank pain you’ll know why I’ve counted this time in minutes). For me this highlights what healthcare needs and it’s not more DIAGNOSTIC INNOVATION it’s basic SERVICE MODEL innovation. Even if we ignore how boring and predictable the output of this tricoder will probably be (“drink more fluids, exercise more, eat less, stop drinking alcohol, don’t even think of smoking, etc”) isn’t it obvious that it’s going to need service model innovation to prevent a situation developing where there are 6 month waiting lists for a diagnosis that took 6 seconds? For me this example epitomises what’s wrong with medicine today in the USA. Here we have a prolifically successful Doctor who is the Director of the Scripps Translational Science Institute, Chief Academic Officer for Scripps Health, a Professor of Translational Genomics at The Scripps Research Institute, Chair of Innovative Medicine at the Gary and Mary West Foundation, and whilst he has access to the worlds best procedures in a drop of a hat his ability to communicate with an informed physician remains firmly where it was in the times before the invention of the internet. The need is one of communication but the solution to finding change is not talking about it but doing it and if the reality is that informed patients like Eric aren’t choosing Doctors who are accessible what hope have we that the rest of society can see the merit in this? In a circuitous way this gets me back to the comment about Guttenberg and what he’d be doing if alive today. In my opinion he shouldn’t have Doctors writing off the value of their colleagues in “today’s technological world” or referring to them as merely a “gateway to subspecialists or technology tests” but finding Doctors we can champion that are seizing the future opportunities that exist today. In my opinion the individual who is best placed to understand your firms mHealth potential is the one who sees themselves as a customer already (eg. not a future customer depending on the materialisation of various uncertainties). Recently I met with an exec working at a global telco who asked about how they could provide the 3G Doctor service to their execs. In contrast to this I’m seeing mobile brands trying to coax medical device and pharma brands into working with them. In my opinion it’s through the adoption of mHealth yourself rather than using it as a CSR exercise that you’ll be able to make things happen quicker.